VR headsets are notorious for causing dizziness and nausea in users. Despite being a groundbreaking tech advancement, many people avoid using headsets due to this issue. The newest models of VR headsets are designed with comfort in mind. This headset is designed for comfort and comes with its own touchpad. And it’s amazingly affordable. Despite the large size, the Gear VR is surprisingly lightweight. That means more playtime and streaming time without developing a headache. 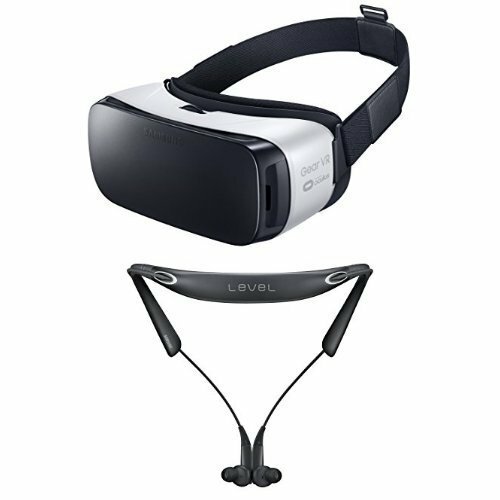 The Gear VR headset offers a wide field of view. It can precisely track the movement of your head. This allows for the recreation of a more immersive world without causing vertigo in the user. The headset fits exceptionally well on any head size. The interior of the VR headset is really roomy. You can wear glasses while using this product. Extra padding is provided to make wearing these even with glasses less physically arduous. The headset can easily be adjusted with the straps. It’s easy to use this between wearers. The Galaxy S& and S7 Edge, Note 5, Galaxy S6, S6 Edge, and S6 Edge plus. It can suit other phones as well. But it works best with Samsung phones. This headset can overheat really quickly, especially with Samsung phones like the Note 5. It also has no physical buttons. So using the touchscreen alone may cause wrist or hand fatigue. Though this headset is ergonomically designed, it can be too big for users with small faces. Oculus is a name that is practically synonymous with VR. So if you are serious about your headset, this is the brand to go with. 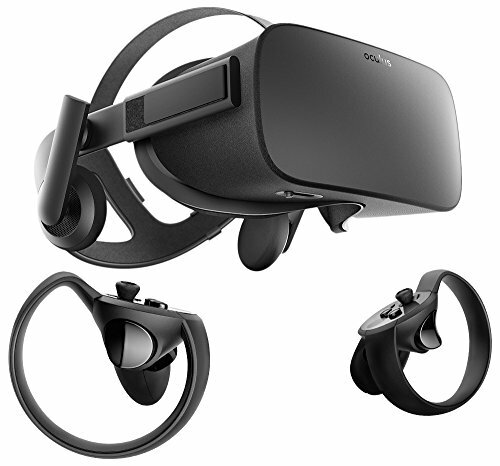 The Rift+ is the latest VR headset from the iconic brand that retains the best of classic features and introduces some new ones in the process. The tech is unparalleled in the industry. The Oculus ultra-low-latency tracking is the best at creating highly immersive environments. This headset is intended for use with PCs. Thus the immersion level you get is truly the best that current tech offers. NVIDIA GTX 1050Ti or AMD Radeon RX 470 or greater graphics card, at least 8GB of RAM, and Windows 7 SP1 64-bit or higher OS. The headset comes with 6 free games. It’s not compatible with Macs, unfortunately. Wearing comfort is truly superior too. The headset is well-cushioned and doesn’t feel uncomfortable during long gaming sessions. This headset is quite pricey. So don’t buy it if you want something cheap to go with your smartphone. If you are a gamer, you will experience gaming unlike ever before with the Rift+. It’s suitable for the occasional HD streaming as well. 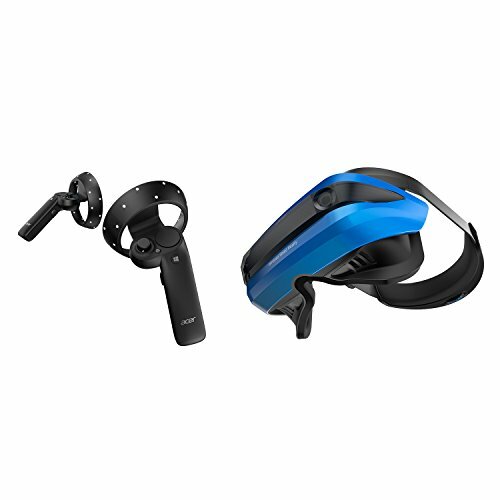 Acer’s blue gaming VR headset is packed with high-end features and is comfortable to wear. The good stuff doesn’t just stop there. Though pricey, this VR headset is exceptionally well-made. The parts have sleek and smooth surfaces that make handling easy for prolonged periods. This gaming VR headset comes with its own controller. That allows for a lot of freedom of movement when playing. Think of it like the Wii but in a much more immersive environment. The headset is capable of supporting resolutions up to 1,440 x 1,440 per eye. Refresh rates go up to 90Hz. This headset has its own gyroscope, accelerometer, and magnetometer. It connects via both HDMI and USB 3.0 ports. The tracking camera does works from the front and doesn’t capture motion from behind. It’s not a major deal but can be annoying for some games. All the sensors are built-in. So there’s nothing protruding that interferes with gameplay. The headset is very easy to set up. It works right outside the box and doesn’t require installing additional hardware. The headset works exclusively with PCs only. It works with gaming apps as well as VR chat programs or regular video apps like Skype. Brace yourselves for the VR headset that started it all. This is a very basic headset made out of, well cardboard. It’s not just any cardboard. Google uses high-quality, sturdy cardboard and lens material in this headset. It’s still cardboard, so don’t expect it to last. Don’t let this headset anywhere near water. However, the price is super cheap. Despite the basic nature of the headset, it functions really well. The design is highly user-friendly. Wearing comfort is so-so because it doesn’t have any padding inside. The VR headset offers 360-degree views of immersive environments. You can use this with Google Street View to look around and feel like you are really there. The headset works with the Google Cardboard app. It offers tons of content for the gadget and plenty of YouTube demonstrations. This headset is designed to be used with smartphones. It works with any type of smartphones including Android devices and the latest iPhones. This supports larger, phabelet phones with screen sizes up to 6 inches. This headset is great for watching YouTube VR 360-degree videos. HTC’s Vive is the most affordable of pricey gaming VR headsets. It packs some unique features that you won’t find anywhere else. The Vive has its own built-in mic. When the headset is on, there are no additional speakers jabbing at you, so you can comfortably get lost in the immersive environment. This VR headset is designed to support highly 360-degree views with highly realistic sound. In addition to the integrated earphones, the Vive takes things further with comfort. The Vive is well-padded so wearing it for prolonged periods is not an issue at all. It’s lighter than the Acer, so it doesn’t bear down on the head. The integrated earbuds may not suit everyone. Some users have complained of the earbuds falling out during gameplay. Another problematic detail is the cable bundle. There will be many cables hanging out from the back that can somewhat restrict freedom of movement when wearing this headset. But the above issues are minor compared to the performance of the Vive. It’s exceptionally designed and even includes a strategically placed dialer. All VR headsets function the same, in that they transport you to an immersive world. However, VR headsets can differ in their purpose. Some are made for smartphones while others are made for computers. VR headsets made for smartphones can support the phone while the user enjoys an immersive gaming or streaming experience. Smartphone VR headsets tend to be the cheapest. These also get the most complaints about causing dizziness, however. If you want a VR headset for your smartphone, then you will need this type. Most high-end VR headsets are designed for PC gaming. These headsets should be connected to a computer via a USB port or an HDMI cable. Despite being for gaming, these headsets also works with programs like YouTube or Skype. You cannot interchangeably use a PC gaming headset with a smartphone one. Therefore, carefully choose the one you want in advance. The area where your eyes meet the lens should be a roomy box for viewing. If it’s not spacious enough, you may feel nausea, vertigo, or extreme discomfort. If you wear eyeglasses, make sure the viewing room can accommodate them. To further avoid nausea, buy a viewing box where the eye lens howls are ideally wide apart. This distance matters because a mismatch could cause the viewer distress. The viewing box should naturally be bigger for smartphone headsets because it needs to hold the phone inside. For PCs, some room in front of the eyes would help keep you cool when playing. VR headsets are mostly made out of plastic and other synthetic material. But there are also cardboard versions. The rudimentary VR headset is made from cardboard and has a lens made out of water and plastic. 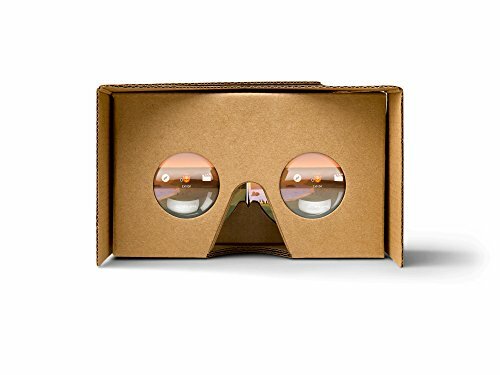 So it’s not unusual to find VR headsets still being made out of cardboard. If you are ordering online, don’t judge the headset by photos alone. Ask the seller specific questions about the material before making the purchase. Does the VR headset come with a built-in mic? 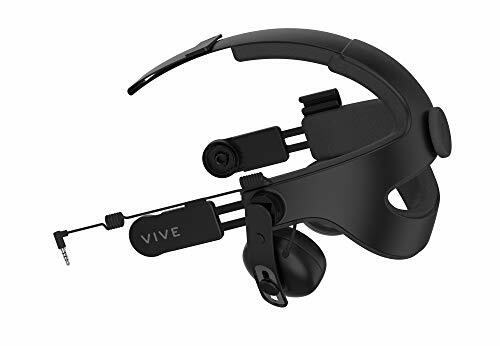 Like the Vive, a headset with a built-in mic would be quite useful because you won’t have to use additional hardware. Simply put, you need to ensure that a VR headset is comfortable to wear and supports new features before making a purchasing decision. Check strap sizes and padding information if you want a comfortable VR headset. When buying a VR headset for smartphones, be careful about overheating issues. The phone battery can heat up the entire system. If your VR headset came with an adjustable strap, make sure it fits your head size. When buying a headset for a phone, you will need to compare the dimensions of the phone to that of the viewing room of the headset. Gaming VR headsets almost exclusively work with PCs. Therefore, know the specs required before you make a purchase. VR headsets can transport you to a sci-fi-like world. However, you won’t be able to enjoy this with a subpar headset. Pay attention to the important features mentioned above when buying the headset you want. You will have to consider different features when buying a headset for gaming or streaming on smartphones. Refer to the buyer’s guide and read our reviews to make the best purchasing decision to suit your needs.